The RCSLT is currently establishing and promoting its research strategy; its vision is to involve all SLT clinicians in research, whether by using the evidence base to inform their clinical practice or to actively engage in research. Clinicians are in a unique position to contribute to this since they are a prime source of viable research questions which directly relate to their services and service users. But how can this be done within the time constraints imposed by SLTs' pressing service objectives? This book will help to increase SLTs' competence and confidence in conducting small-scale research studies. It contains practical information, advice and guidance to help clinicians get started on manageable research based on their everyday caseload and activities. Drawing on the experiences of expert contributors and, wherever possible, providing examples of real studies it will help readers perceive the research potential within their clinical contexts. Creating Practice-based Evidence will also guide prospective researchers where to seek support and how to achieve realistic and achievable goals. It will appeal particularly to SLT teams and their managers who wish to develop a research culture in order to support their local services and clinical practice. ...I read the book in one morning and found it very easy to read with clear descriptions, examples and explanations of the different aspects of the research process - making it feel very accessible. The exercises enabled me to check that I had understood and could use the information contained in each chapter. The iterative process of revisiting the whole research process as well as the specific chapter area really helped me to embed a good understanding of clinical research. Read the Journal of Clinical Practice in Speech review. 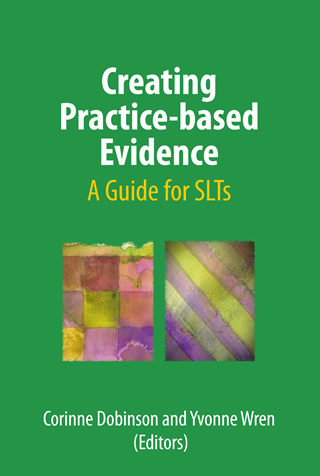 ...This is a very useful and encouraging book for any SLT considering creating practice-based evidence and would be a valuable addition to any SLT department. Yvonne Wren is a Senior Research Speech and Language Therapist at the Speech and Language Therapy Research Unit, Frenchay Hospital, Bristol, and is also a Visiting Research Fellow at University of West of England. She has presented at national and international conferences on children's speech sound disorder, and has authored book chapters and papers on interventions for children's speech impairment and working with schools.